If you want to look like Lauren Bacall or Gene Tierney, you want The Middy Haircut. Tune in to see if this is the haircut for you, and if you need to modify it to fit your life. I am so frustrated, why can’t I style my new haircut? There are a multitude of reasons you may be feeling frustrated with your new hairstyle. I certainly hope it is not because you have a horrible haircut that is impossible to style properly! Let’s look at some more probable, positive alternatives. 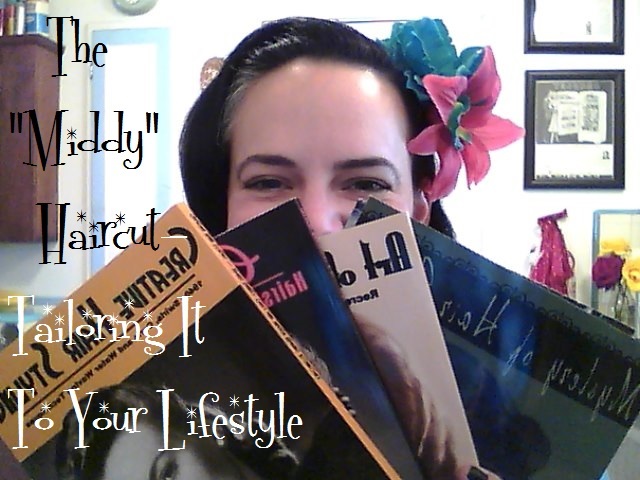 Styling aides-It is possible you are using the wrong styling products. If your new haircut is dramatically different, you may be trying to style this updated look the way you are used to styling your old hairdo. You may need a different product, one that is more suited to a shorter shape, or a straight look. Take a look at the hairstyle you have now, and choose your product accordingly. You may need to do a little shopping. Tools- It is also possible your styling tool is inappropriate. If you are trying to straighten your hair with a larger brush and it is not working, you may not be getting the grab and pull you once were. If you now have layers and you want more body and volume, you may want to look at some round brush options. The way you blowdry will also change depending on your new goals. Your stylist will point you in the right direction. Grandma may say keep calm, there is nothing a cupcake can’t solve. As The Curl Turns would never disagree with this golden logic. p.s-Limescale in your toilet can be cleaned with a liter of Coke. Pour half in and let it sit for an hour. Flush and repeat. Some of the limescale buildup should be dissolved by the phosphoric acid in the Coke. When the new year rolls around it is inevitably time to take stock of ones life, and sometimes, to quote Grosse Pointe Blank, “leave your livestock alone.” But if you are ready for a change, chances are your stylist is ready for your change as well. My client came in last week and our consultation started out rather slow. She thought she just wanted a trim, and she said she was uninspired, but she is always so open minded. She had been growing out her layers but now that she had had that for a while she was kind of ho-hum about it. So I sat with her and waited. This always gets them thinking. “Well, I did see a picture of this one haircut…..” and we were off to the races. So we cut her hair in a new fun layered cut. I was able to use a layering technique I don’t normally use to give her the disconnected cut she was describing, and she came out feeling pretty wild. Now she wants to buy a purple guitar. If your Grandma says a new hairstyle probably won’t change how you feel, she has never tuned in to As The Curl Turns. p.s-to disinfect a broken blister, dab on a few drops of Listerine. It may sting, but it is a very powerful antiseptic. 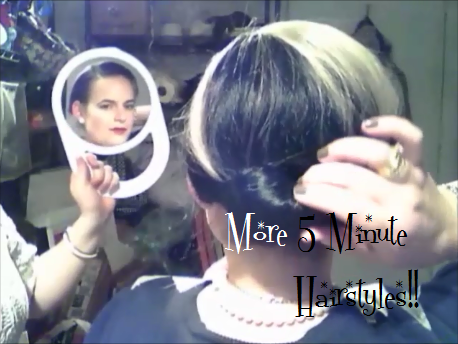 Video-Backroom Basics, Episode 8- More 5 minute hairstyles for busy women! Mornings are stressful enough, here are two quick and fun hairstyles to help you shave off some precious minutes. Everyone, no matter who you are- bus drivers, engineers, landscape architects, and the avon lady- are all busy during the holidays. Everyone has a schedule and it is bound to change. The ripple effect begins, and sometimes it waves out to your hairstylist. Now, the holidays are a bum rush for a lot of salons because everyone wants to look like a fresh dandy for family and friends. Clients start booking out until the end of the year in September so that spots are secured and they don’t have to deal with the maylay of gamble scheduling two weeks before Christmas. But things happen and we understand that. Work is an unpredictable place, and meetings and travel can be called and cancelled on a dime. Unfortunately, that does not mean we can cancel, or create an appointment around those dimes, especially this time of year. So if you can’t make your scheduled appointment for some spur of the moment reason, you will probably have roots and long bangs for the holidays because we just can’t fit you in any other place. We would love to, because we don’t want you uncomfortable and not able to see! We want all your friends to worship your hair because you are our walking advertisement. But the holiday schedule can only accommodate so many appointment times. Grandma may say there is always room for one more, but As The Curl Turns knows we all only have two hands. p.s- when standing around the holiday hors d’oeuvres table, remember not to double dip! Aren’t we all! No one wants to get the call that a client is dissatisfied. The mind races through that previous appointment, questions flying. Was my consultation thorough enough? Didn’t we look at the swatches? I thought they were happy when they left! Did I say A B and C? If the client calls in a reasonable amount of time, say a week, and they want to come back in, it is prudent to have them come in as soon as you can. If they wait two or three weeks to call, that is approaching maintenance time, and the areas become more gray in determining whether or not it is actually a re-do. Discuss the problem with the client, down to the smallest detail, no matter how uncomfortable it makes you. You may have made a mistake. On the other hand, you may have given the client exactly what they asked for, but upon further reflection (or, more likely, a negative comment from someone they care about) they changed their minds. In that case you didn’t make a mistake, but either way a change needs to be made. The tough part is discussing the monetary expense. My policy is a re-do that is my fault is done at no cost. A re-do that is needed because the client changed their mind is the slippery slope. Most honest people will insist that they pay you since you did what they initially wanted, and then it is totally up to you whether or not you charge them. And if a significant time has past since the appointment and they are just now complaining, you can simply tell them that it is not a re-do any longer, and the normal service cost will apply. Grandma may say the customer is always right, but As The Curl Turns believes in a little wiggle room. p.s- if you have loose nuts, nails, bolts etc. stored about the garage, save your baby food jars and store the pieces in that. They are the perfect size to separate out your stray hardware.